An eyewitness in Port Washington, Wis., described a large object that flew over her home at an altitude of 500 feet in October 1998. 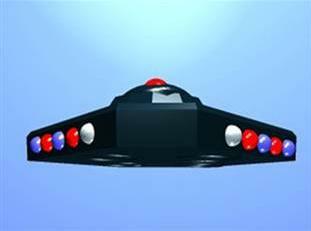 The witness's husband is a graphics artist, so this graphic reconstruction from the pair shows a football field-sized, wedge-shaped object with flashing red, blue and white "disco lights." They have become legendary in UFO circles. Huge, silent-running "Flying Triangles" have been seen by ground observers creeping through the sky low and slow near cities, and quietly cruising over highways. The study points out: "The United States is currently experiencing a wave of Flying Triangle sightings that may have intensified in the 1990s, especially towards the latter part of the 1990s. The wave continues. The Flying Triangles are being openly deployed over and near population centers, including in the vicinity of major interstate highways." 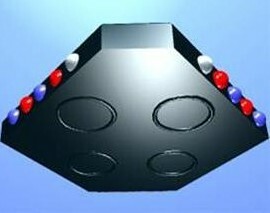 A key NIDS conclusion is that the actions of these triangular craft do not conform to previous patterns of covert deployment of unacknowledged aircraft. Furthermore, "neither the agenda nor the origin of the Flying Triangles are currently known." The years 1990-2004 have seen an intense wave of Flying Triangle aircraft, the study observes. Sifting through reports by hundreds of eyewitnesses, the NIDS assessment states that the behavior of the vehicles "does not appear consistent with the covert deployment of an advanced DoD [U.S. Department of the Defense] aircraft." According to Colm Kelleher, NIDS' administrator, the newly completed quasi-"meta-analysis" of Flying Triangles melds three major databases, from NIDS, the Mutual UFO Network and independent researcher Larry Hatch, the creator and owner of one of the world's largest and most comprehensive UFO databases. "However, I cannot say whether these are U.S. Air Force aircraft. We simply don't know," Kelleher told Space.com. "But it does not appear to be consistent with the covert patterns of deployment we saw with the F-117 and B-2 prior to their acknowledgement. This is open, even brazen." For example, a perfunctory look at the how past military stealth aircraft programs were kept from the public eye - although they eventually came to light - is different from the patterns for the Flying Triangles. "In contrast, the Flying Triangle deployment, especially during the 1990s, appears more consistent with the open and public operation of these aircraft," the study explains. The trend of open deployment of the Flying Triangles is not consistent with secret operation of an advanced military aircraft. The vehicles sometime fly with easily noticeable bright lights - either blinding white lights, or "bright disco lights" that usually flash combinations of red, green or blue. While it is too early to dismiss the previously published NIDS correlation between Triangle sightings and a subset of U.S. Air Force bases, the apparent association with centers of population may point away from a covert program. "Rather, it is consistent with routine and open deployment of an advanced aircraft," the NIDS study concludes. "Suddenly this monstrosity came out of the 'blue,' just like a Star Trek 'uncloaking', no kidding ... so quiet I couldn't believe it and so huge ... no more than 500 feet or so up, and big enough to take up my field of sky vision," she reported. "In 2004 it is extremely difficult to distinguish between these two possibilities, since the former option overlaps heavily with legitimate national security concerns, while in the absence of much more physical evidence, the latter option is not testable," the NIDS assessment concludes.